Local students receive donated school supplies to kick-off the new school year. Members of Springboard’s S.E.R.V.I.C.E. committee are pictured with staff and clients of Community Action Partnership of Riverside County. 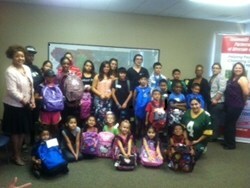 Local area students received the donated backpacks just in time for the start of the new school year. This is truly an outward expression of the care and concern we have for the community. Springboard Nonprofit Consumer Credit Management, Inc. (“Springboard”) donated 135 backpacks filled with new school supplies to local children in need. This is the third consecutive year that Springboard has donated supplies to students receiving assistance from family shelters in Riverside, San Bernardino and Upland. The charitable backpack program is coordinated by Springboard’s S.E.R.V.I.C.E. committee, which held several fundraisers throughout the year to raise money to purchase backpacks and supplies for students enrolled in Pre-school through 12th grade. Employees also donated several more backpacks and supplies that were purchased with their personal funds. Springboard’s S.E.R.V.I.C.E. committee is comprised of volunteer team members from across various departments within the agency who are dedicated to making a difference in the community, above and beyond their day-to-day job responsibilities. Springboard is the largest full service housing and consumer credit counseling agency on the West Coast. “The charitable backpack giveaway is employee driven and demonstrates the kindness and generosity of our associates,” said Melinda Opperman, Springboard’s senior vice president. “This is truly an outward expression of the care and concern we have for the community,” said Opperman. Springboard contacted family shelters in the region that helped identify families needing the most assistance in providing back to school supplies for their children. Springboard frequently collaborates with local nonprofit organizations and community stakeholders to provide important services to the community. SPRINGBOARD® Nonprofit Consumer Credit Management is a 501(c)(3) nonprofit personal financial education and counseling organization founded in 1974. Springboard is a HUD-approved housing counseling agency and a member of the National Foundation for Credit Counseling, a national organization of nonprofit credit counseling agencies, and a member of the Association of Independent Credit Counseling Agencies. The agency offers personal financial education and assistance with credit counseling, housing counseling, debt and money management through educational programs and confidential counseling. Springboard is accredited by the Council on Accreditation, signifying the highest standards for agency governance, fiscal integrity, counselor certification and service delivery policies. The agency provides pre-bankruptcy counseling and debtor education as mandated by the bankruptcy reform law. The agency offers nationwide phone counseling services and has locations in California, Arizona, Nevada, New Mexico, Texas, Massachusetts, and South Carolina for in-person counseling sessions. Not all types of counseling are available in-person at all locations, please call for details. For more information on Springboard, call 800-449-9818 or visit their web site at http://www.Springboard.org .